On June 19th 2017 the extreme-right fanatic Darren Osborne plotted to assassinate Jeremy Corbyn, he is currently on trial for what he is alleged to have done next; deliberately driving a hire van into a crowd of people in Finsbury Park, killing one person and severely injuring several others. In the days before his trip to London Osborne had been trawling the Internet for content from the extreme-right hate chamber Britain First. He also received personal messages with the Britain First co-leader Jayda Fransen and the extreme-right former EDL leader Tommy Robinson in the days and weeks before the attack. There's no doubt that he was radicalised into plotting a political assassination by his interactions with the Britain First hate mob and other extreme-right figures like the former-EDL leader Tommy Robinson. Then there's Thomas Mair who brutally murdered the MP Jo Cox in 2016 whilst screaming "Britain First". The extreme-right hate group immediately tried to dismiss their links with him, but he was photographed at a Britain First street protest just months before he carried out his murderous attack. There's no doubting the fact that the Britain First hate chamber is radicalising people in extreme-right politics, and even into plotting acts of extreme-right terrorism. The authorities are showing no signs of clamping down on this dangerous hate group, turning a blind eye as Britain First participants praise acts of extreme-right terrorism, laud extreme-right killers as heroes, and even conspire to raise cash as an slush fund to induce other people into committing acts of extreme-right terrorism. If this online hate group was an Islamist extremist group in which members praised and glorified acts of Islamist terrorism, and even conspired to raise funds to incite others into committing acts of Islamist terrorism, we all know they would have been banned (and rightly so). But because it's extreme-right indoctrination, and the glorification of extreme-right terrorism, the UK authorities continually turn a blind eye. Despite continual breeches of their so-called 'community standards' in the Britain First comments Facebook continue to host this disgusting extreme-right hate mob. Presumably because they consider stuff like racism, bigotry, glorification of terrorism, extreme-right indoctrination, and even plots to raise cash for extreme-right terrorists as perfectly fine, as long as Facebook continue making stacks of cash out of hosting the hate mob on their site. So if the authorities are unwilling to act, and Facebook are unwilling to act, it's up to us as a community to make sure that our friends and family are not being radicalised by this dangerous extreme-right hate mob. Before I give you the link to check which of your friends and family are at risk of extreme-right radicalisation by the Britain First hate mob, please make sure you use it responsibly. If you just unfriend these people you're doing nothing to help whatever. What you need to do is reach out to them and explain that Britain First is an extreme-right organisation that is led by a bunch of criminals and scam artists, which is hellbent on stirring up such hatred and division that their followers are plotting and committing acts of extreme-right terrorism. They need to know that Britain First is not only linked with the murder of Jo Cox, but with Darren Osborne's plot to assassinate Jeremy Corbyn too. If you just unfriend them to "purge" your Facebook friends, you're doing nothing to help at all, when these people that you know are in danger of indoctrination and extreme-right radicalisation. The UK authorities clearly have no interest in protecting people from this vile extreme-right radicalisation outfit, and neither do Facebook, so it's up to us to look out for our friends and family who could be in danger of being radicalised by them, and warn them about what they're dealing with. 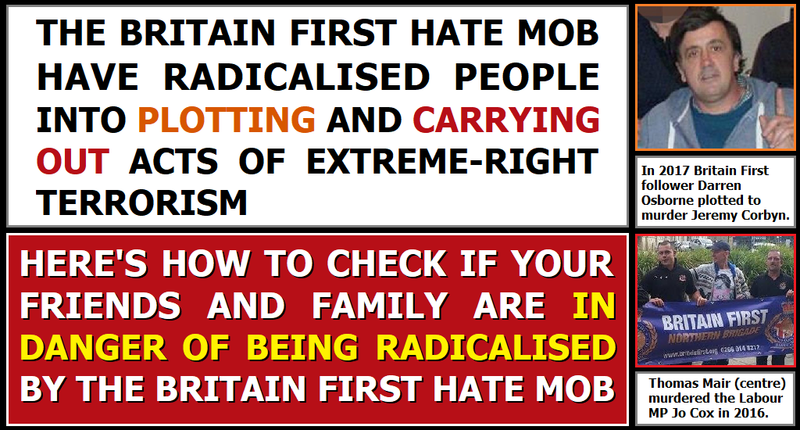 Click this link to find out which of your Facebook friends follow the Britain First hate group.